Robert F. Kennedy dedicated much of his career to public service, fighting for civil rights during his tenure as U.S. Attorney General and against poverty while a U.S. Senator. During his presidential campaign of March 16-June 5, 1968, he brought hope to those who supported him, believing that he could heal a nation plagued by racial divides, poverty, and the Vietnam War. He entered the already close race after other candidates. A victory in the California presidential primary would demonstrate to the Democratic Party that Kennedy was a strong candidate for the November election, but a loss in California could end his campaign. California was a tough three-way race between democratic candidates Vice President Hubert Humphrey, Senator Eugene McCarthy and Kennedy. It was a “winner takes all” primary with all 174 California delegates pledged in support of the winning candidate. On the day of the primary, June 4, 1968, Kennedy traveled to his California campaign headquarters at the Ambassador Hotel in downtown Los Angeles where he awaited the election returns. When the ballots were tallied, Kennedy won 46% of the vote, more than the other candidates, winning the California primary. 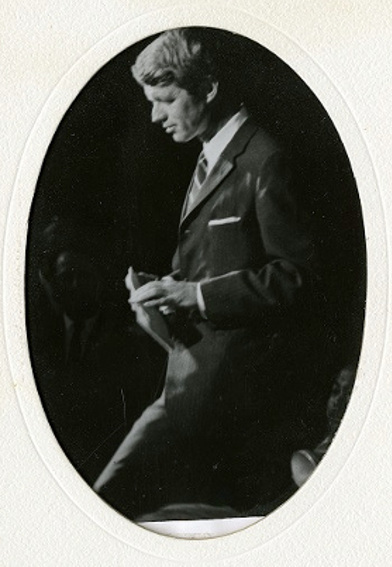 In the early morning hours of June 5, 1968, he left a 5th floor suite of the hotel and went to the Embassy Ballroom where more than 1,800 people were waiting for his victory speech. In his speech, he spoke about ending the violence and divisions that had plagued the country, concluding his speech with “Let’s go on to Chicago and win there,” to obtain the Democratic Party nomination for President. Kennedy and his supporters left the Embassy Ballroom entering a serving preparation area of the hotel that was referred to as the pantry. As Kennedy was shaking hands with the kitchen workers and others who had gathered to greet him, Sirhan Sirhan stepped from behind a dish rack and began firing a .22 caliber Iver-Johnson revolver. Kennedy and five other people were wounded. Senator Robert F. Kennedy, 42 years old, died the following day. In 1987, the City of Los Angeles transferred the records of the Los Angeles Police Department investigation of Kennedy’s assassination to the California State Archives. Archives staff has prepared a sampling of media-ready digital files relating to the Kennedy campaign and the events of June 4-5, 1968. The guide to the Los Angeles Police Department records of the assassination investigation and the guide to a companion collection of records from the Los Angeles Sheriff’s Department documenting the incarceration of Sirhan Sirhan from June 5, 1968 to May 22, 1969 are available here . A selection of photographs from the Los Angeles Police Department investigation files including photographs by Los Angeles Fire Department photographer Harold Burba of the struggle for Sirhan Sirhan’s gun and Los Angeles Police Department photographs from the investigation. A selection of documents from the Los Angeles Police Department investigation including the notebook pages and writings found in Sirhan Sirhan’s home. The audio recording of the phone call from an Ambassador Hotel operator to the Los Angeles Police Department reporting that "Senator Kennedy has been shot."